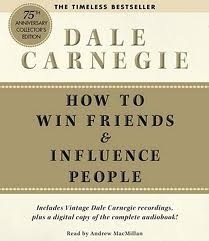 I am reading a wonderful book by Dale Carnegie that I suggest everyone should read. If you have not read this delightful and helpful 283 page book, please do! Here is a lovely tid bit. In an article in Bits and Pieces, some suggestions are made on how to keep a disagreement from becoming an argument. Welcome the disagreement. Remember the slogan, “When two partners always agreed one of them is not necessary.” If there is some point you haven’t thought about, be thankful if it is brought to your attention, perhaps this disagreement is your opportunity to be corrected before you make a serious mistake. Distrust your first instinctive impression. Our first natural reaction in a disagreeable situation is to be defensive. Be careful. Keep Calm and watch out for your first reaction. It may be you at your worst not your best. Control your temper Remember, you can measure the size of a person by what makes him or her angry. Listen first. Give your opponents a chance to talk. Let them finish. Do not resist, defend or debate. This only raises barriers. Try to build bridges or understanding. Don’t build higher barriers of misunderstanding. Look for areas of agreement. When you have head your opponents out, dwell first on the points and areas on which you agree. Thank your opponents sincerely for their interest.Anyone who takes the time to disagree with you is interested in the same things you are. Think of them as people who really want to help you, and you may turn your opponents into friends. Postpone action to give both sides time to think through the problem.Suggest that a new meeting be held later that day or the next day, when all the facts may be brought to bear. In preparation for this meeting, ask yourself some hard questions: Could my opponents be right? Partly right? Is there truth or merit in their argument? Is my reaction one that will relieve the problem or will it just relieve any frustration? Will my reaction drive my opponents further away or draw them closer? What price will I have to pay if I win? There are many wonderful tips and life lessons to living in harmony with others. When you understand that our inherit desire to be important is universal, we can make life a lot easier for others as well as ourselves. This book was written in 1937 but still holds true today. Read it and see. I just ordered this…before I saw your blog! Hope you’re doing well! !